Another stressful day living in St Croix. 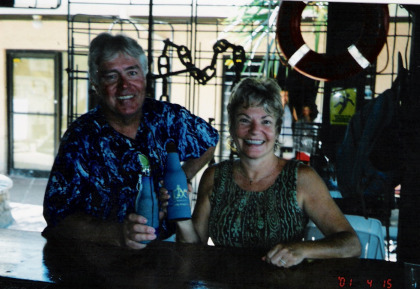 Living in St Croix, was great for us, maybe you too. 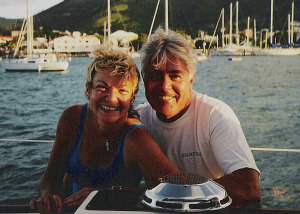 The last 3 winters we had the boat 1999 to 2002 we spent the entire winter anchored in St Croix. Although we lived on the boat, we spent so much of the year there we bought a car and set up residence. Drivers license, paid taxes (same as US), set up Post Office, bank, joined a church and gym etc. In 1917 the US purchased the USVI from Denmark for 25 million in gold. It was during WWI and we didn't want a (then) enemy having a naval base so close to the US. It is a US territory, same laws, and protections as in the US. Not being able to vote for president is about the only difference than living in the 50 states that are somewhat colder than the USVI...maybe not a bad thing. The largest of the Virgin Islands St Croix is 34 miles long, 7 miles wide, it also has the biggest industrial base. Formerly Hess Oil, now the Venezuelan Oil Company, St Croix has the largest refinery in the Western Hemisphere. They also distill Cruzan Rum, on the island. Because of the influx of refinery workers from Puerto Rico, 80 miles away, 45% of the St Croix residents speak Spanish (and English of course). St Thomas, the capital of the territory, is the cruise ship capital of the world, we have seen 10 ships in port on the same day...gets a little crowded in Charlotte Amalie downtown on those days. St John, thanks to the generosity of Laurance Rockefeller, is 60% national park and very sparsely populated. All have great, mid 70s to mid 80s, weather year round with gentle ocean breezes the norm. Living on St Croix is popular with some snow birds who visit only in the winter. For frugal retirement living there are a lot of condos throughout the islands with many below $100,000. The downside is the homeowners association fees which can and do run to $500 a month, whether you are there or not...why? insurance for hurricanes is really costly. It would be a great place for living on a boat...you don't need a mega yacht. If it is watertight you are going to be fine. I am guessing as to how much one would cost but $10,000 for sure, would buy you a floating home for living in St Croix. Again you are encouraged to rent before you buy. Come to St Croix for a few months rent an apartment and see if island living is for you. Some folks report "rock fever" and find it is not for them...we never had that malady. The same things you would do in any state. We joined a church did volunteer work by painting the exterior ( a designated national landmark) of the parish hall. We joined a gym, not only good for you it saved on the use of fresh water on the boat. Direct flights to the US are available from the local airport. Now the locals know how to party and any excuse for a parade is a good one in my humble opinion. 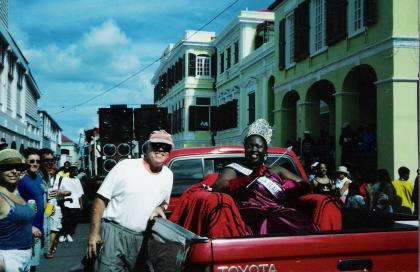 Downtown Christiansted three Kings Day parade. St. Patrick's Day was also a big celebration, all the bars close at about 5 PM that day... There was no further need for the services that they offered since the party started at about 9 AM. Green hair, green beer, and lots of aspirin were required to fully enjoy St. Patrick's Day on St. Croix. We attended a Lutheran church in downtown Christiansted, 2 blocks from the water. The church was founded in the 1700's at the local Danish fort and moved to the current location in the 1830's. The marble floors have worn spots from the traffic over the years. The sanctuary you see is decorated for Palm Sunday. 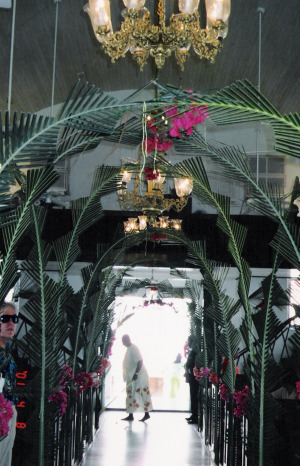 There is no shortage of palm fronds on St Croix and they really have it decked out for Holy Week. We made many friends at the church and attended to several holiday celebrations in the homes of the locals. The people that live on St Croix are warm and friendly. If you want to live in the Caribbean, but really stay in the US, consider living in St Croix. We did for 3 years, had a wonderful time and would do it again...so can you.